Every commercial organisation is looking for an edge, something different, unique; golf tourism is no different. The stock formula has worked for decades because the market has very identifiable requirements with a few adjustments around the fringes, namely the location, style and class of the offering which therefore dictates the price. Historically, the USA and likes of Spain/Portugal have dominated as preferred golf holiday destinations with the UK close behind due to its association with the history of the game. If it wasn’t treading the links in the footsteps of Old Tom Morris you were after, like as not in Europe the lure would be great weather which is what every golfer craves; helps the feeling of well-being and soothes the aches and pains which all lead to a smoother swing and a better score…at least that’s what we all believe. This accounts for Carolina and Florida as the most prolific USA golf destinations. Add to great weather a Jack Niklaus (or other named) masterpiece in excellent condition and the stage is set perfectly. The only remaining item essential to all holidays is good accommodation perhaps by the sea or another exotic location with great views, and the easy availability of wonderful food and drink. Make it all appear tremendous value and you have a recipe for success, something not lost on the industry’s leaders. Thankfully, due to cultural differences Asia provides some of those special details which make a great deal of difference, namely a natural inclination to make customers happy by providing superb service, particularly true of Thailand the Land of Smiles. One of their secret weapons is the female caddy who can turn a bad day of golf into a bearable, even pleasant one. When Asia appeared on the scene (excluding Japan which is parochial and a separate case) the opportunity was there to innovate but to a degree the advice given, mostly by western consultants, was do it like us but a bit better, but more extravagant (aided by the global shift in economic influence and power, hence money). This was as a result of an industry ruled to a large degree by conservatism. Signs of this abound, you only have to take a look at Mission Hills in China to see it is all about grandeur, famous names and a heritage from the last 20-40 years. Naturally the facilities are extravagant, quite superb, but is it innovative or just a good idea scaled up? The good news is that golf tour operators were prepared to explore different ways of doing things and signs of golf tourism innovation are manifest in Thailand courtesy of a collaboration between the Bangkok-based inbound golf tourism operator Golfasian and Australia’s Go Golfing. Go Golfing pioneered the concept of full-blown amateur tournament golf managed along professional lines (Tournament Director/Official scoring etc) for golfers over the age of 35 of all abilities who want the holiday experience but aren’t averse to a bit of excitement while on the golf course; the formula is proving popular. There are several key components to the golf: don’t play medal golf but rather a points system (in this case stableford, widely used in Australia) which keeps pace of play acceptable and create several “divisions” based on age, gender and handicap so everyone plays in groups of a similar standard and age plus has the opportunity to compete for what can be extravagant prizes. Importantly, stay at great hotels and finally make sure there is plenty of socialising at the end of every day so people can meet and greet, the holiday atmosphere is maintained and things aren’t taken too seriously. 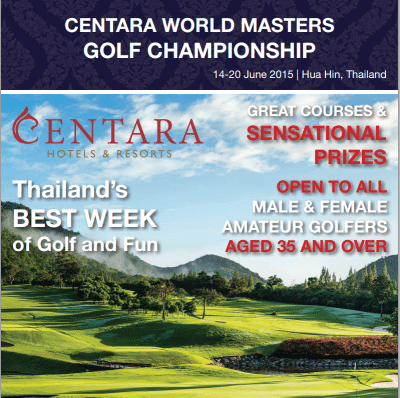 The first example of such a tournament in Asia was the Centara World Masters played in Hua Hin last June which attracted 500 competitors from 23 countries. Chosen for its royal seaside resort credentials and access to superb golf, in particular the award winning Banyan and Black Mountain, it was an instant hit. Feedback was extremely positive, immediately afterwards competitors were asking when the next event would take place. This winning formula was not lost upon the organisers and the 2015 Centara World Masters will again be staged in Hua Hin 15-19 June. This year over 600 participants are expected and the prize fund is now over $70,000. A similar tournament is scheduled for Vietnam in September.